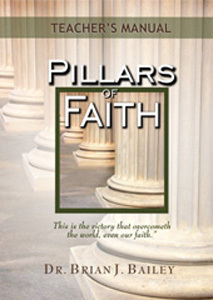 This teacher manual is based on Dr. Bailey's thought-provoking book Pillars of Faith, in which he opens up our understanding of God’s principles of faith. As we journey with him on the path to a more perfect way of faith, we are challenged afresh to enter into new realms of the Spirit where mountains are moved and faith becomes action! Dr. Brian J. Bailey was president of Zion Fellowship International, Zion Ministerial Institute, and Zion Christian University for over thirty years. In his fifty year ministry he traveled to over one hundred countries ministering in churches, seminars, and Bible schools. Dr. Bailey has also authored over sixty books, teaching believers the ways of God and how to become established on the pathway of holiness that leads to spiritual Mount Zion.